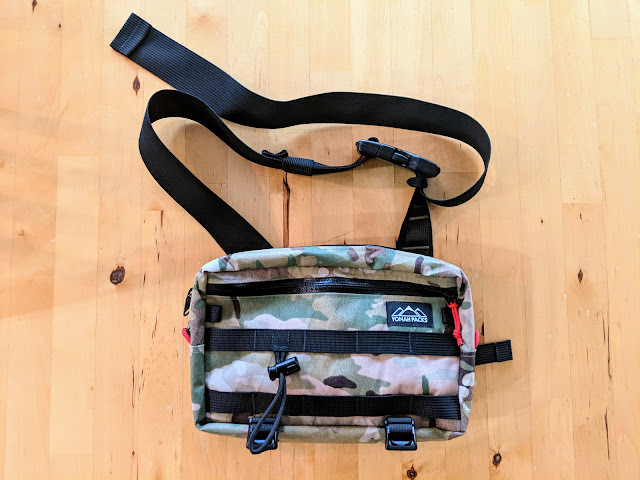 Today I'm going to present a "first impressions" gear review of the Yonah Packs Minimalist Sling / Fanny Pack. I was sent this pack by Marcelo, the gentleman who hand-makes each pack, to sample about a month ago. 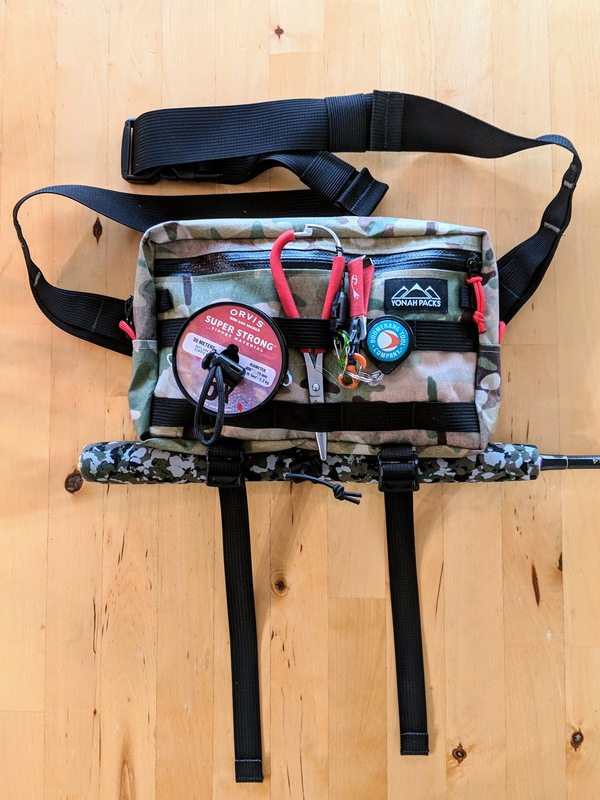 Unfortunately, it showed up just after the big Tenkara Campout outing, so I really haven't been able to use it on the water yet. 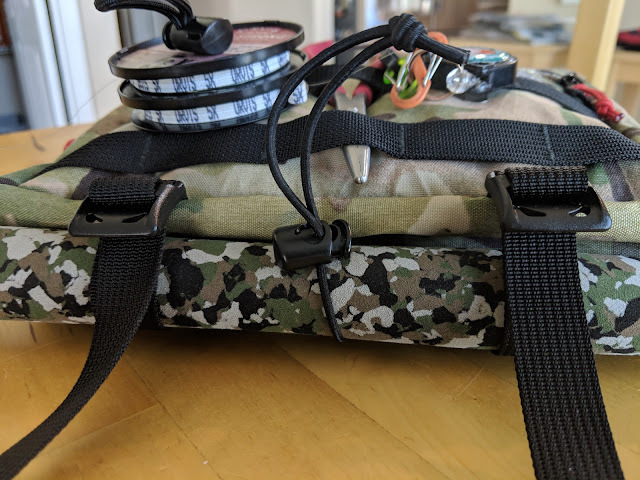 That being said, I have been able to poke, prod, pull, and stuff this little pack quite a bit over the past few days, and feel like I have a pretty good grasp of how it would best be used, as well as what sort of capacity it has. Measurements are 9” wide x 6” tall x 2.5” thick and weighs about 7 ounces. 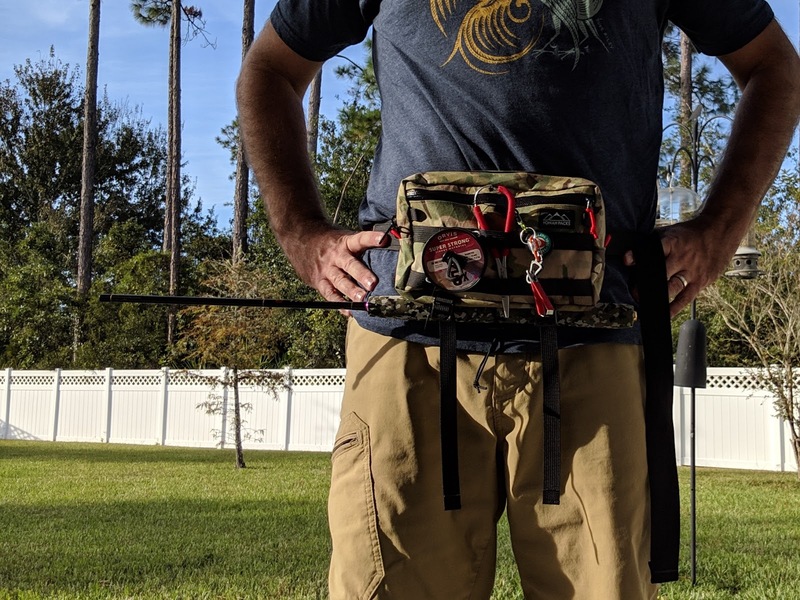 A very minimalist tenkara fanny pack that can double as a sling pack and carry everything you need for those hot summer fishing trips. The pack has a zippered compartment up front to carry a small fly box or any other smaller items. The nylon webbing in the front has various attachment points for all of your fly fishing tools and tippets. This allows for quick access to all your frequently used tools and gear. The main compartment has 2 line spool pockets and one large cell phone/wallet pocket. On the bottom there are straps that will hold a water bottle or a tenkara rod securely. There is also some shock cord with a cord lock on the bottom to further secure a tenkara rod. OK, sounds good so far... but let's dive in a bit deeper. I'm not going to lie, I was impressed. Sometimes you get handmade things from Etsy and they're a little sketchy. Bad sewing, poor zippers, stuff like that. 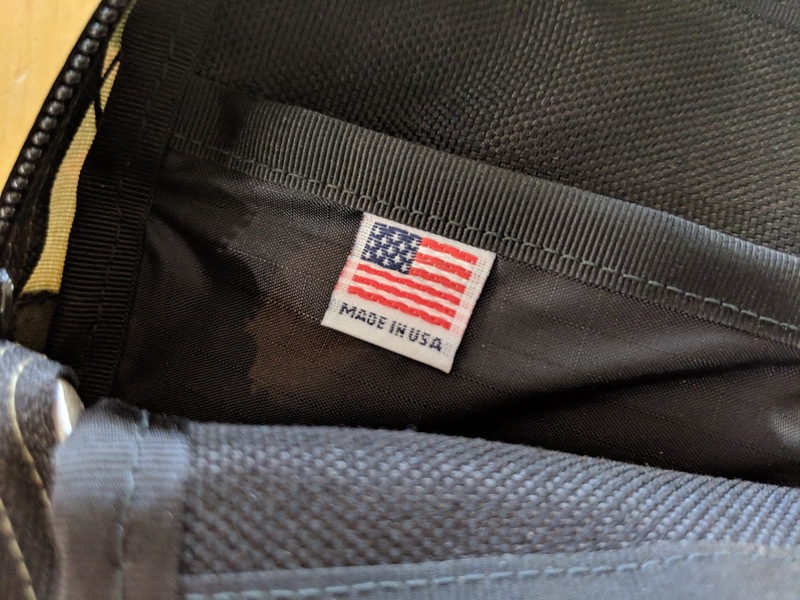 This pack appears pretty much bombproof, without a single stitch out of place. I gave all the zippers really firm pulls and they all moved silky smooth. The main compartment is made out of X-Pac (the fabric, not the wrestler), which is a multi-layered, lightweight laminate fabric that's also water-resistant. It's just solidly executed, all the way around. So this is what I decided to do to get a grasp of capacity. First, I grabbed my Vedavoo Tighlines sling. 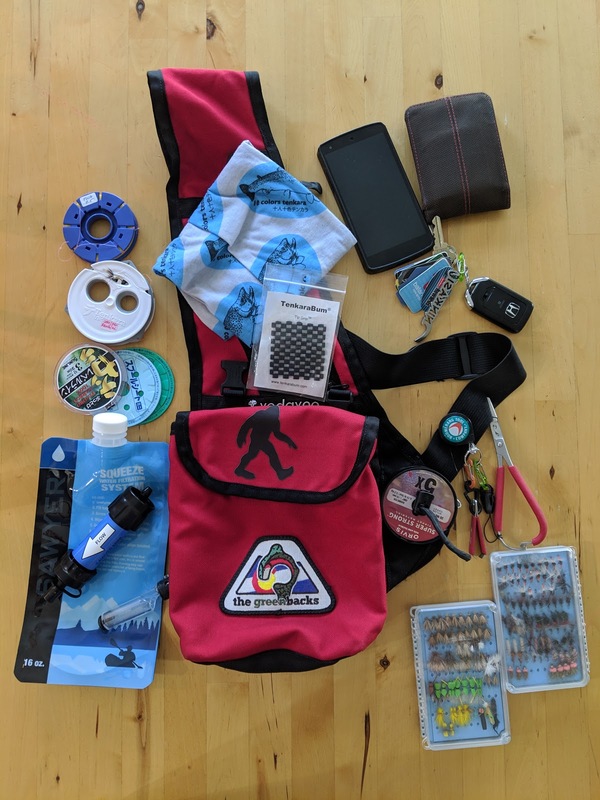 It's the pack I most commonly use for a day on the water if I don't also need to bring a rain jacket, snacks, a first aid kit, or extras like that. (For that I upsize to the Zimmerbuilt Deaddrift pack). I've used the Vedavoo for the better part of 7 years, so it's been through the ringer and I highly recommend it. And my typical contents, that were all comfortably crammed inside. The contents are (clockwise from upper left): 2 line spools, 2 line cards, a spool of level line, a Buff, a tip grip, cell phone, wallet, keys, tippet spools, forceps and nippers on a zinger, two tacky fly boxes, and a Sawyer squeeze water filtration system. 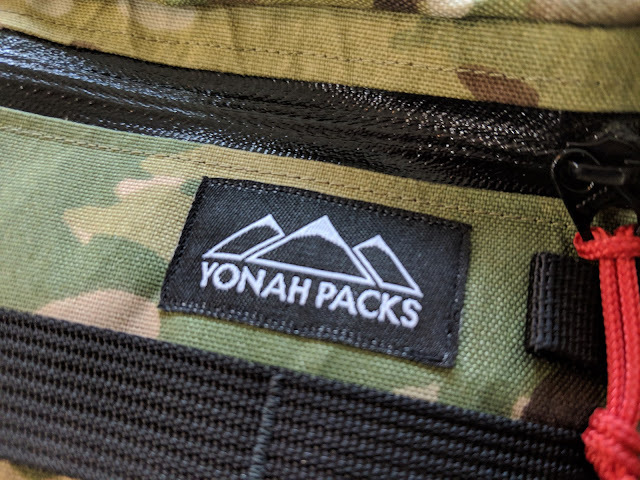 So then I decided I would load up the Yonah pack as best I could with the same stuff. 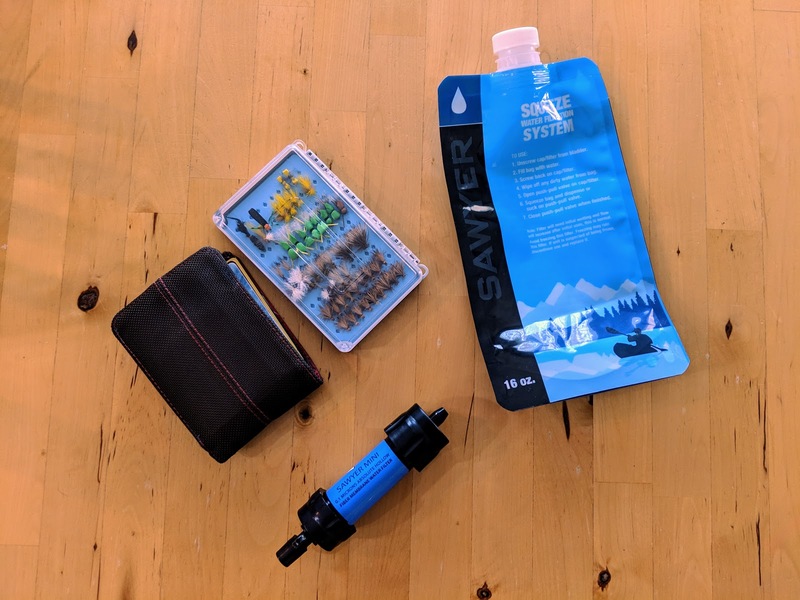 My wallet, the Sawyer filtration system, and one of the Tacky fly boxes were all a no-go. However, everything else was tucked neatly away. PLUS, I was able to use the loops on the bottom to cinch down an (extra) tenkara rod. If I didn't want to bring an extra rod, those same loops can be loosened far enough to hold a water bottle or perhaps a rolled up rain jacket... so that's a definite +1 for the Yonah pack. A large front pocket holds thin items. I used it for the Buff and tip grip. Probably could have crammed something else in there, but the extra fly box or my wallet didn't fit. And on the inside, there are two small pockets that I used for the line spools, and a larger pocket I slid my phone into. The main compartment held everything else. Probably could have fit a Clif Bar or something in there too if I wanted to pack a snack. So all in all, very comparable capacity-wise. 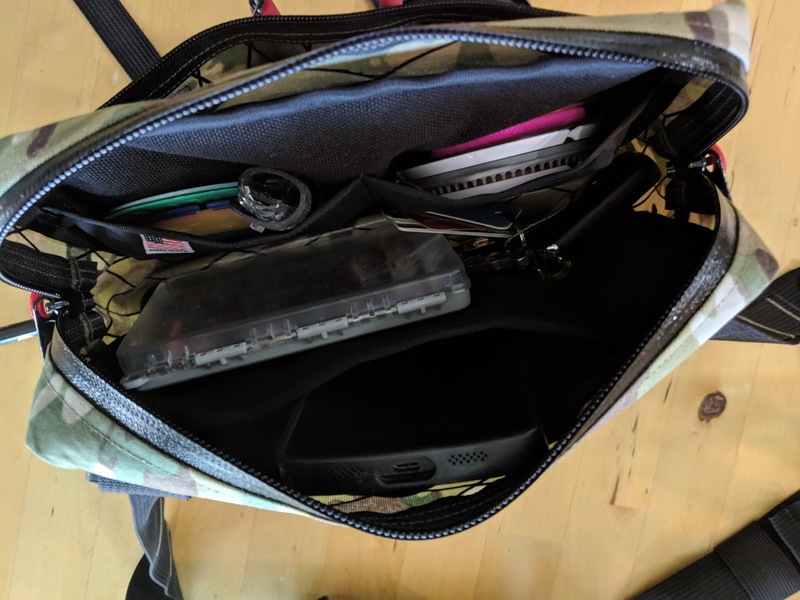 My wallet is somewhat Costanza-like in nature, so I'm not surprised it didn't fit as-is, but I'm sure if I just wanted to carry an ID and credit card it would be no problem. Now in terms of functionality, this bag definitely has one up on the Vedavoo. Natively, it's a fanny pack. 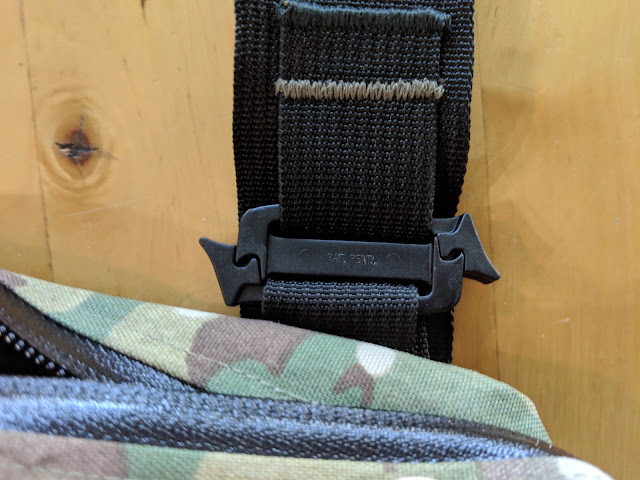 It has a webbed belt with an over-sized nylon buckle that adjusts easily and I suppose can be worn in the front or behind you. But here's the really slick thing. 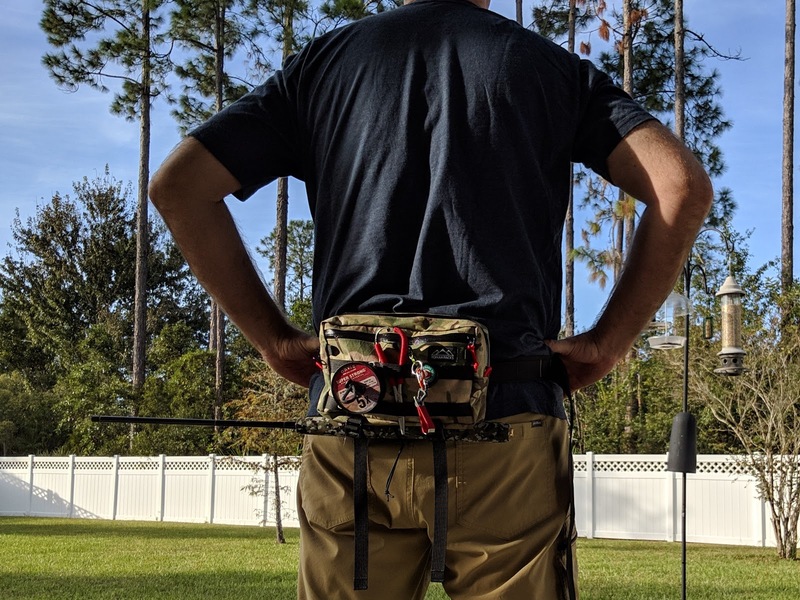 It does convert into a legit sling pack. 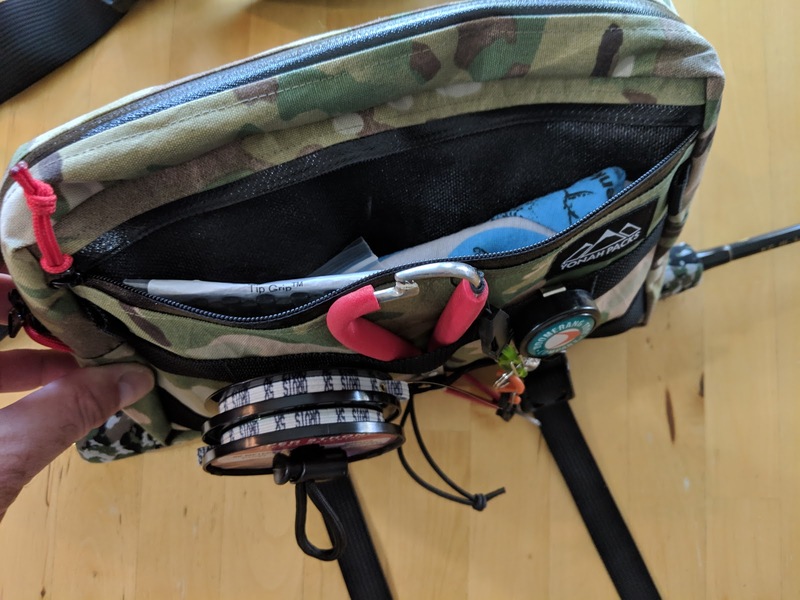 There a little clip on the back of the bag and if you slide the webbed strap through it, it realigns into a shoulder pack. And when swung around to access the contents, sits horizontally. It's actually well thought out and executed. I guess in the end, you probably want some sort of summary. Well, being that this pack hasn't been put through the rigors of multiple fishing seasons (at least by me) like the Vedavoo pack, I can't fully endorse it quite yet. That said, all signs point to it getting an excellent final review overall, and I look forward to putting it through some headwater fishing experiences in 2019. 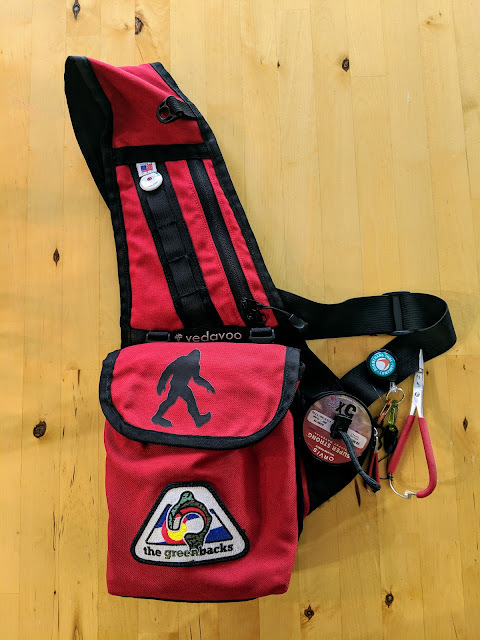 So, if you're looking for something to scratch the minimalist pack itch, (without leaving all your creature comforts behind), I think this Yonah Packs Minimalist sling / fanny pack might just be what you're looking for. The pack currently retails for $75, and can be found HERE. 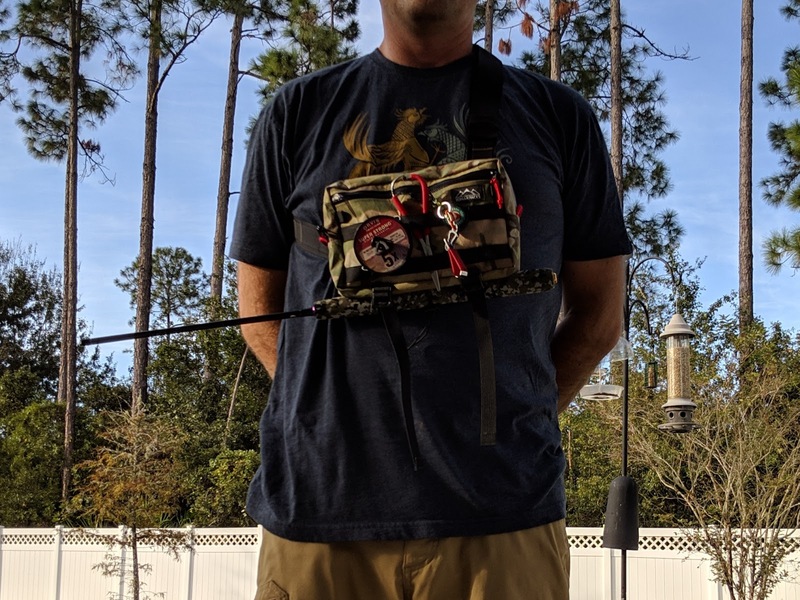 The Minimalist sling/fanny pack featured in this product review was provided to me at no cost, but carries a suggested retail price of $75. I currently hold no official association with Yonah Packs and did not solicit them for the product to review, nor receive any financial compensation. It was simply offered to test for feedback. 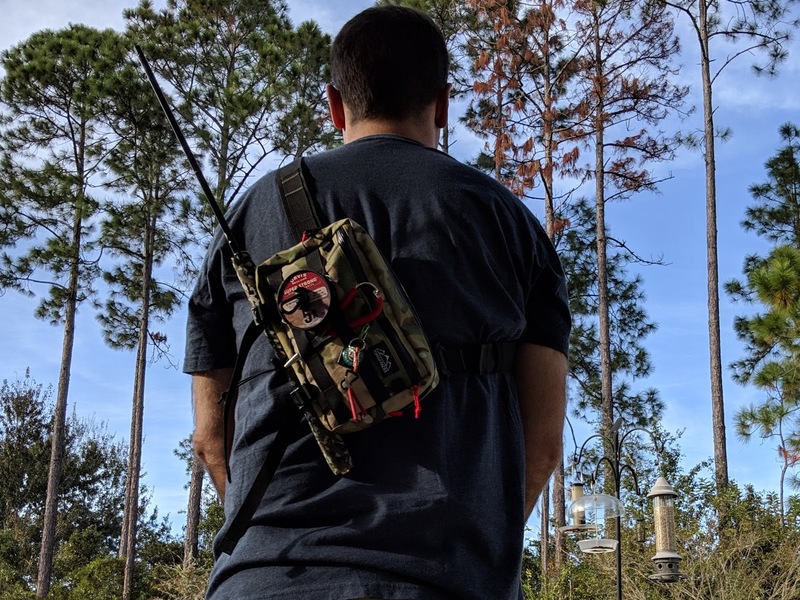 As with all independent gear reviews at Troutrageous! I try my best to keep my reviews honest and unbiased. This policy pertains to items both purchased and provided at no (or reduced) cost. Thanks Bill. I'm trying to slim down my gear myself. It's amazing what you find you don't really need once you choose to not bring it along! Very thorough as usual, Mike. Thanks for the review. This might bee something that I can use when doing a short excursion somewhere and don't need so much gear. Good stuff. Happy Thanksgiving this week too!